As we reported back in October, Dame Julie Andrews was in talks with a team of doctors about a possible fix for her damaged vocal chords. The damage occurred after Ms. Andrews had surgery in 1997 to remove nodes from her vocal chords. Unfortunately, the surgery caused a scar tissue build-up which destroyed her famous soprano voice. Andrews was thought to be one of the first patients to undergo a new surgical treatment developed by Robert Langer of the Massachusettes Institute of Technology and voice specialist Dr. Steven Zeitels. The pair would remove scar tissue from the vocal cords and then would inject them with a gel called polyethylene glycol. Designed by Langer and his team, the gel was specially designed to mimic the natural elasticity of vocal cords. TimesOnline.co.uk is reporting that Dame Julie has scheduled an upcoming "comeback" concert in London. Twenty years have passed since the 74 year old singer's last stage performance in Britain and generations of fans are eager to hear her. Although all of our research shows that Dame Julie has not undergone the treatment yet, it has been said that she has started to sing little by little and has begun to regain the confidence in confidence alone. 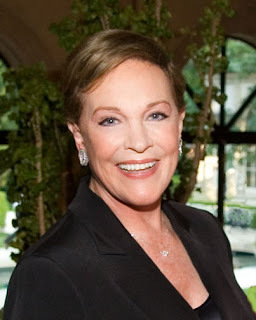 In recent years, there have been a few concerts “hosted by” Julie Andrews, in which Broadway singers performed songs associated with her or with leading ladies in general. The number of these concerts has increased during the past season and have become more focused on Dame Julie. As a matter of fact, in many of the concerts, she even narrated a musical arrangement of one of her children’s books. During the last "hosted by" concert of the season, Dame Julie surprised her live audience by mustering all of her determination, confidence and stoic fortitude ... singing four solo songs. The upcoming "comeback" concert, set to be at the O2 arena in London where Michael Jackson was to have performed, will be an extension of these "hosted by" concerts. Maurice Whitaker, of IMG Artists, the agent for the show, told the TimesOnline that he promised that Dame Julie “will be performing four or five genuine solo numbers” as well as singing with other vocalists. "Singing is partly a confidence game," Whitaker continued, "and she has regained it." Songs on the program are said to include the Rodgers and Hammerstein classics Edelweiss, Getting to Know You and Oh, What a Beautiful Mornin’. Link: "The hills are alive: Dame Julie Andrews plans singing comeback on London stage next year" at the timesonline.co.uk.